Do you often have trouble areas around the hips, thighs, or tummy, but still like to wear tight clothing? Or maybe you have trouble with seams that stick out? Is cellulite a possible problem? Then shapewear is the best choice for you! Find your individually required shapewear tights from our extremely versatile range of products. Our shapewear is of top quality materials and helps with tummy flattening, and thigh and buttocks firming around the bikini zones to enhance a lovelier shape. Choose shiny or matte texture, sheer, semi-sheer or opaque appearance. Available in wonderful basic shades. We also have plus size shapewear available. 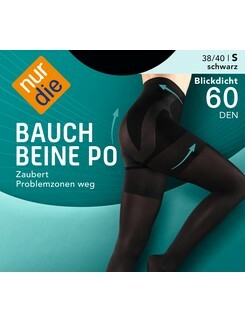 This category additionally offers shapewear tights with a re-vitalising support function as well as long-term slimming effects that are enhanced with anti-cellulite agents for a skin-smoothing effect. Narrow down your selection by choosing options from the drop down boxes on the left hand side to filter for criteria like material, size, and price.